Musings and insight from the people that make your paint. An article in our current issue of Just Paint, Beauty and the Best: Wrestling with Changes in Williamsburg, discusses results of accelerated lightfast testing for 23 colors that, until recently, were all listed as having ASTM Lightfastness ratings of ‘NA’ – or ‘Not Applicable’ – since none of them had formally been tested and submitted for approval to the ASTM Subcommittee on Artists’ Paints. 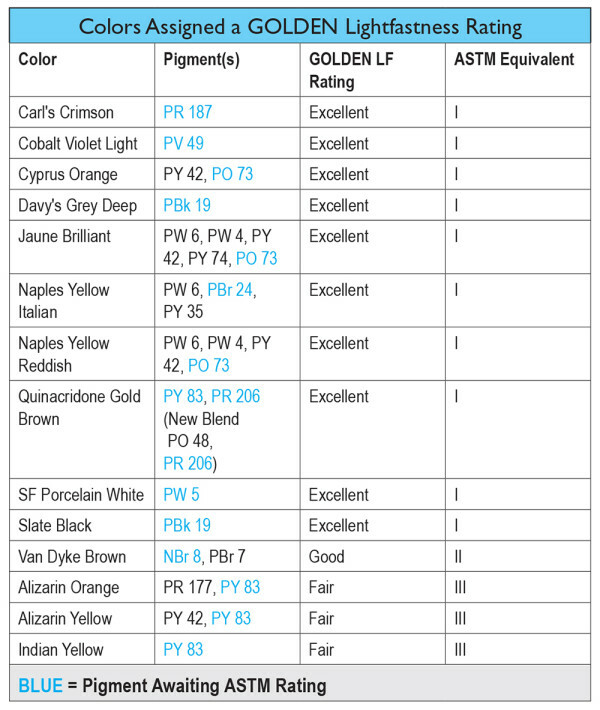 We are currently planning to share these test results with the ASTM Subcommittee in early 2016, with the hope of adding these pigments to the list of ones that have been officially evaluated. 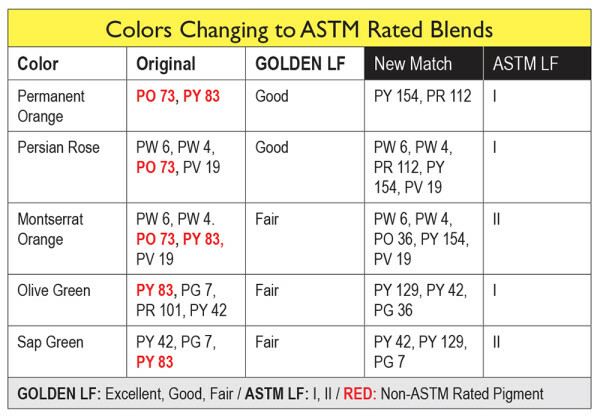 In the meantime, we have chosen to replace most of the NA ratings found on our labels, color charts, and brochures with a Golden assigned one based on ASTM D4303 test procedures. At least in this way artists will have some guidance on how lightfast a color might be while we wait for the ASTM process to be completed. It is hard to summarize such broad testing within the space of a blog, so for those wanting to delve into the details more fully we would strongly encourage you to read through the entire article at JustPaint.org. What follows are simply some of the highlights drawn from that larger piece. 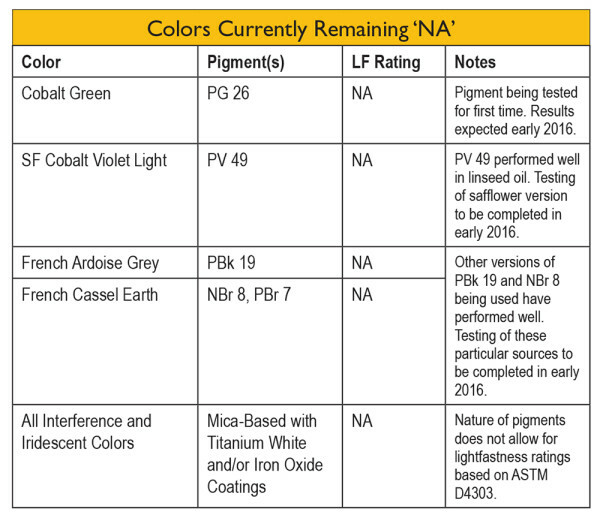 Next we walk readers through a large group of colors that completed their testing and ultimately will be submitted to ASTM, but in the interim are bring assigned a Golden lightfastness rating. As you will see, the vast majority of these ended up with a rating of Excellent, the equivalent of ASTM I, while even Van Dyke Brown did exceedingly well, coming in at Good, or the equivalent to ASTM II. Only three colors presented a difficult choice – Alizarin Yellow, Indian Yellow, and Alizarin Orange. All three contain a transparent version of PY83, a diarylide yellow that in its opaque form is among the most lightfast yellows available. However, based on the test results, this transparent version would need to be rated as Fair, or the equivalent of ASTM III, the same category as Alizarin Crimson. The difficulty we faced was deciding whether to keep these as-is or replace them with other more lightfast formulas that would draw on different pigments. In the process of searching for something, however, we quickly discovered there truly was no real substitute for the luminosity and sheer beauty these colors possessed. They are, in a very real sense, unique and offer a type of jewel-like glow that would be lost if they were not available. 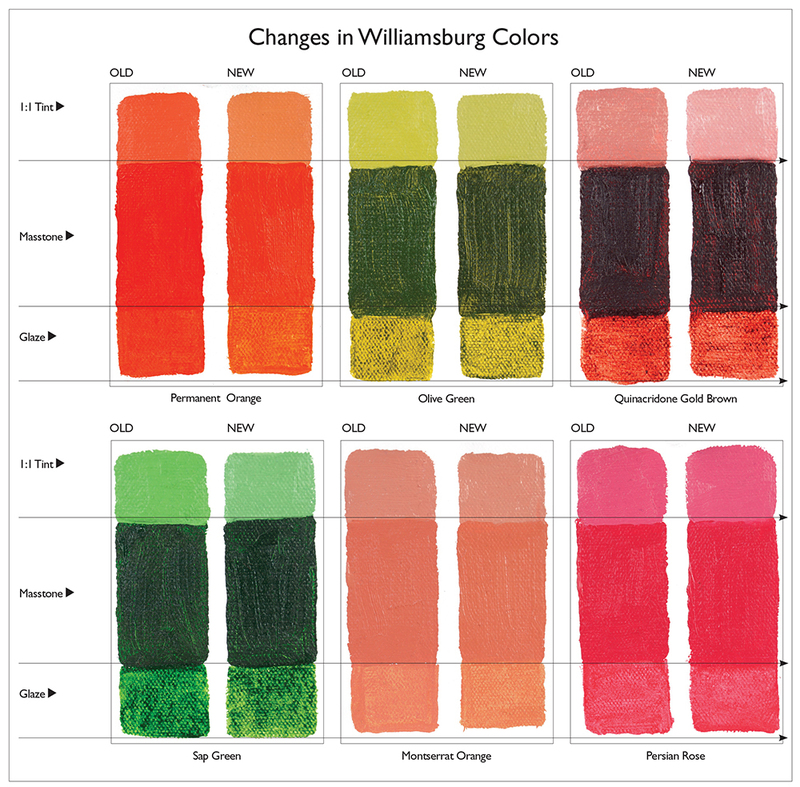 So, like Alizarin Crimson, we have decided to keep them as a part of the Williamsburg line, making sure artists continue to have access to them but with far better information being provided about their lightfastness. And as you can see in the following image, the color shifts are often subtle, with Permanent Orange probably showing the greatest change, becoming warmer and more orange in the process. In the end, we are aware that some of these changes might cause concerns about lightfastness or how the new blends will perform on the palette and in mixtures. In the long run, however, we also feel strongly that these decisions have put the Williamsburg line and legacy onto firmer footing while providing much more information to the artist. For addition details about all the test results, please go to the full article Beauty and the Best: Wrestling with Changes in Williamsburg. And if you have any questions, large or small, leave a comment or simply email help@goldenpaints.com, or call 800-959-6543 / 607-847-6154. This entry was posted in Uncategorized by Sarah Sands. Bookmark the permalink.